This ridge-side town with a stunning backdrop of Gauri Shankhar used to fall in the ancient trade route between Tibet and Nepal. Newar traders settled here even before the Gorkha conquest, establishing a mint that is more than 600 years old. That mint is now in ruins, as are most of the historic stone-clay houses lining the cobblestone streets of Dolakha Bazar. While the M7.8 earthquake on 25 April damaged the buildings, it was the M7.3 aftershock on 12 May with its epicentre only 10km away that destroyed 90 per cent of the houses here. Four months on, locals are still living in tents, or makeshift shelters next to their ruined homes. 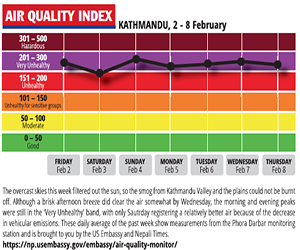 It is clear that Dolakha and nearby Charikot will take years to rebuild if they don’t get any help. The ruined structures need to be safely demolished before new ones can be built. 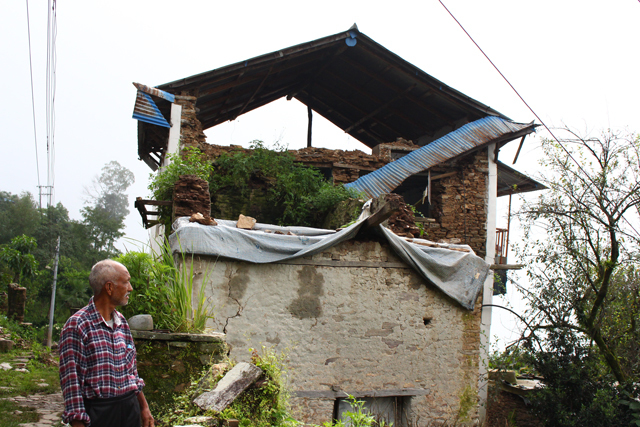 “We are still waiting,” says 74-year-old farmer Purna Narayan Shrestha who was at the Bhimsen Temple and watched as his three-storey house collapsed during the 12 May aftershock. Shrestha is living in a temporary structure with his family and has salvaged bricks and stones from the ruins to rebuild. 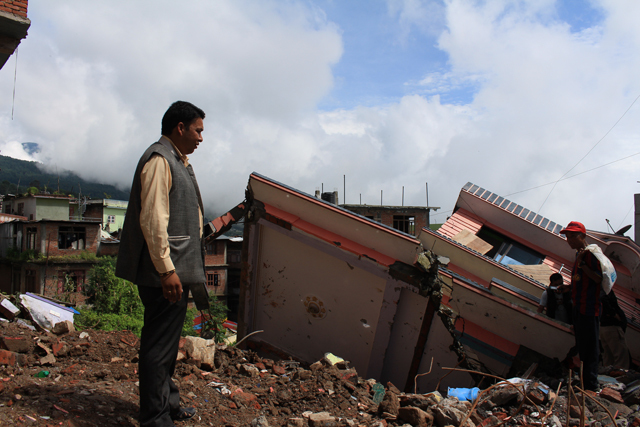 Purna Bahadur Shrestha looks at his damaged house. Up the street, Purna Bahadur Shrestha (pic, above) is still waiting to tear down what remains of his house and says he does not have the courage to rebuild at the moment. “I don’t have money and the rains and aftershocks may bring down what I build anyway,” he tells us. The other reasons no one is rebuilding yet is that there are no workers, and also the fear that they won’t get the government reconstruction grant if they don’t follow new construction guidelines. “There are no workers available to start building again,” complains tea shop owner Shanta Devi Shrestha, 61, looking at the unfinished first storey of her new house. The municipality has also banned the reconstruction of all new houses until the government policy is clearer. In the Charighyang neighbourhood nearby demolition of many of the multi-storey concrete buildings that collapsed on 12 May is just starting. The buildings have either pancaked or are leaning on each other like domino pieces. 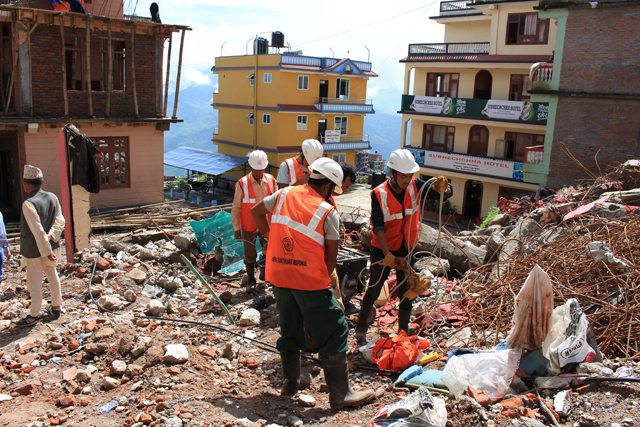 “When we approached local engineers no one wanted to take a chance demolishing the buildings that were risky,” says Sundar Karki of Hotel Sangam which collapsed completely. Sundar Karki of Hotel Sangam stands besides the damaged building. Now, the International Organisation for Migration (IOM) is helping with equipment and demolition expertise. 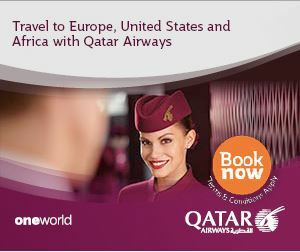 Trade and tourism has suffered because reconstruction can’t start without first demolition of the collapsed structures. 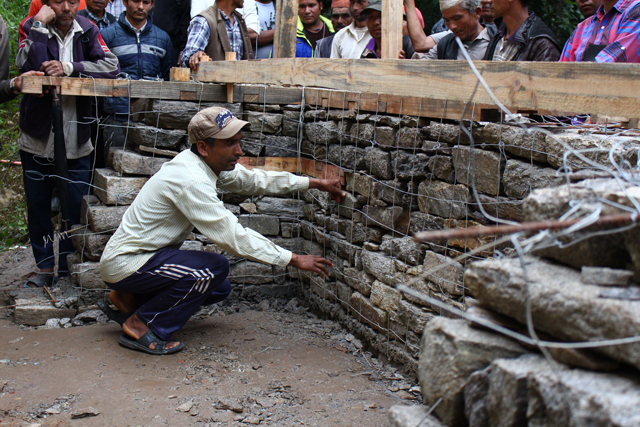 We asked Dolakha CDO Devendra Lamichane about the reason for the delay in rebuilding. He says his office is waiting for the Reconstruction Authority to develop guidelines and send instructions and for the moment is working with voluntary groups and NGOs. Dhan Bahadur BK, 40, has been working as a mason for the past 18 years. When the earthquake struck, many of the houses in his village of Lamabagar collapsed. BK thought his house was built well, and would stand. BK is one of the 55 masons trained in seismic resistant masonry during a training organised by National Society for Earthquake Technology (NSET) with support from Bhimeshwor Municipality, Department of Urban Development and Building Construction and US Agency for International Development (USAID) recently. After attending the five-day training, BK says the houses he helps build from now on will be stronger. 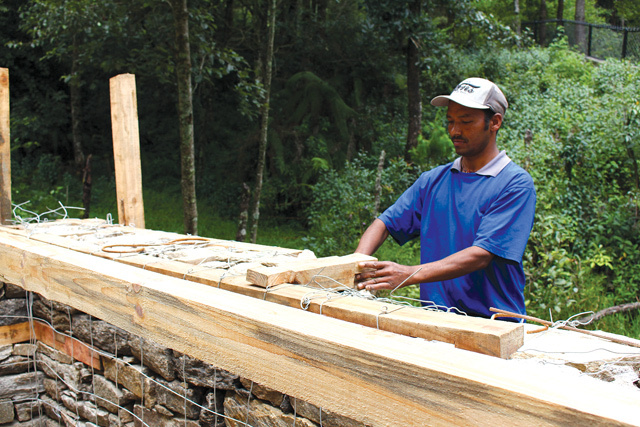 “I learnt new things as well as what I was doing wrong all this time,” says BK who adds that his challenge will be to convince home owners to spend a little extra for sturdier construction and teaching his fellow masons from his village to build back better. The 55 masons are the first of over 5,000 who will be trained in new techniques and also in retrofitting older houses. The course is part of a longer-term effort by which the USAID and its partner NSET aims to contribute to the Government of Nepal’s goal of training 60,000 construction professionals in disaster-resilient building skills. The masons were trained in earthquake basics, site selection and building configuration, quality assurance, construction of earthquake-resistant buildings using stone, brick, and reinforced concrete framed buildings, periodic repair and maintenance, and an introduction to seismic retrofitting. You get a free T Rex with every pack of chicken mcnugget bought on a London street, the plastic dinosaurs are made in China. Plug-in adapters for Taiwanese laptops bought in Singapore are made in China. Plastic water guns on the shelf of a New York Toys R Us: Made in China.